Since Discovery Bay is a waterfront community known for its boating, water sports and bass fishing, having a home with a deck and boat dock is optimal. 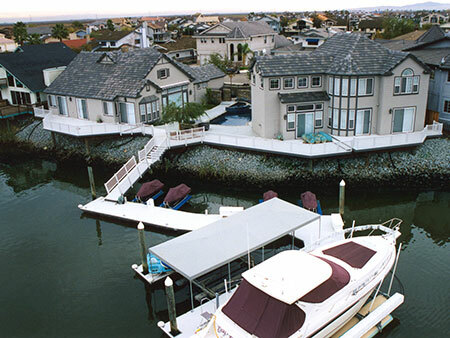 As a pioneer of Discovery Bay, Mid-Cal Construction started building custom homes, decks and docks in the 1970s. With our expertise, workmanship and integrity, Mid-Cal has since built most of the boat docks and decks in Discovery Bay – a business built almost entirely on customer referrals. Mid-Cal builds with all types of decking materials including ipe decking, redwood, and composite decking. However in Discovery Bay, the hot days and cool nights make Brock Vinyl Decking the ideal decking surface. The 100% virgin vinyl with UV protection and the “no screw through decking” clip strip installation provides minimal wear from heat expansion and contraction. Highly durable, the vinyl material is also maintenance free and won’t fade or discolor. It also stays cool in the sun, making it easy to walk barefoot on a hot summer day. As the main source and installation expert of Brock Deck in Discovery Bay, Mid-Cal Construction built one of the largest vinyl decking concentrations in the world. To find out how Mid-Cal Construction can help you with a similar project, please contact us at (877) 754-4418. Copyright © 2015, All Rights Reserved. Mid-Cal Construction specializes in building superior floating boat docks, decks, aluminum gangways, piers, seawalls and marinas. Serving the communities of Northern California, San Francisco Bay Area, Marin County, Sausalito, Larkspur, Tiburon, Belvedere, Mill Valley, Novato, Vallejo, Napa, Redwood Shores, Isleton, Discovery Bay, Sacramento, Bethel Island, California Delta, Sacramento–San Joaquin River Delta, Bass Lake, Lake Tulloch, Point Richmond, Manteca, Oakwood Shores.